AVO Turboworld Stabilizer Bars are designed to bolt into the stock factory brackets, and were set up for a good balance of street and track driving. 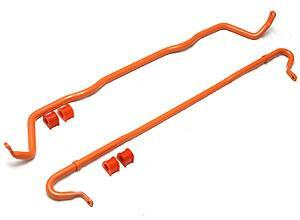 This stabilizer bar includes polyurethane bushings to make the most of this suspension upgrade. It’s a huge improvement over the tiny OEM bars, removing body roll in corners and increasing driver confidence.